The price of oil has climbed despite the lack of demand and a glut of surplus crude. Benchmark crude closed near its highest level in eight months on Friday June 19, 2009 reaching $69.50 on the New York Mercantile Exchange. Gasoline has risen with the price of oil reaching a national average of $2.63 per gallon. Higher oil prices are another factor affecting the economy’s ability to recover. What is fueling this price increase and is it sustainable? Inventories of crude have risen above their five-year average range despite lower demand from the recession. 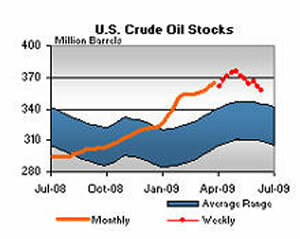 As shown in the chart from the June 17, 2009 Energy Information Administration (EIA) weekly report, inventories of oil have been rising for a year, despite the U.S. and global recession. Many analysts wonder why inventories are so high given the current economic situation. As we will see, there are several reasons that contribute to this situation. Each $1 increase in the price of gasoline costs the U.S. economy $140 billion in spending on other items. According to the Washington Post and the Congressional Budget Office, the total spending from the stimulus package passed in February will reach $107.1 billion in 2009. Since January 2009, the price of gasoline has climbed about $1.00. This rise more than offsets the impact of the stimulus bill for 2009. According to James Hamilton, an economist at the University of California at San Diego, energy costs add more than 6 percent to consumer spending. That is money that will not be spent on home improvement, eating out, a new suit of clothes or go into savings, all things we need to see in order for the economy to improve. While gasoline prices are not as high as they were in 2008, they are on the rise as shown in the chart on the right from the June 17, 2009 EIA. The EIA predicts that consumers will pay a national average $2.70 a gallon by July before prices begin to level off. Any business that depends on energy is feeling the affects of higher prices for crude. The transportation sector, especially airlines and trucking companies are hit the hardest. We have heard how the airlines are charging for everything from checked bags to WiFi access to try to offset the higher cost of fuel. The cost of goods that are shipped by air or truck are also directly affected. This will flow to consumers as higher prices at the store. Higher energy prices will hold any economic recovery in check. Over time, consumers will adapt to higher prices adjusting their spending habits. In addition, the high cost of energy will help spur innovation. However, any affects from new buying habits and innovation will be years in coming. In the mean time, the economy will struggle. If demand for crude is lower and supply is at significant highs, why is the price of crude rising. After all just a couple of years ago, $70 for a barrel of oil was a catastrophe. There are five reasons energy prices have risen They are falling value of the U.S. dollar, production cuts by OPEC, fear of inflation, traders anticipating the recovery of the global economy and some traders using oil to generate significant profits from its “store of value”. The value of the U.S. dollar against a basket of currencies has fallen from a high of almost $0.90 in March 2009 to $0.80 most recently. It is up from a low of $0.72 in the summer of 2008. Oil is priced in U.S. dollars. If the price of the dollar falls, it lowers the value of oil, which hurts producers. To offset this price reduction producers raise the price of their oil on the market. While the recent drop in the value of the dollar is not significant, there is a growing fear the dollar will fall further as the government tries to fund its growing deficit. To help offset the excess supply of oil on the market OPEC is reported to have some success in cutting production. There are creditable reports that up to 81% of OPEC producers comply with the cartels production quotas. This lower production encourages traders to prop up the price of crude. In addition, Venezuela and Mexico are experiencing falling production, as they have not kept up with the necessary investment in new technologies and production development. However, even with the reduced production there is a surplus of crude. Oil traders are worried that the vast amount of money being spent by the U.S. and other countries to rekindle their economies will turn into higher inflation. As a result, they are willing to bid up prices expecting inflation to cause prices to rise over time. While inflation is not here according to current measures, this fear of inflation is causing the price of futures for oil to be higher. Producers also fear inflation, as they do not want to sell their oil at low prices today, if inflation will push up the price of their valuable assets over time. In addition, many traders are anticipating a recovery in the global economy. As the economy recovers, demand for oil will rise, pushing up prices. Like any investor, these traders are willing to bid up the price, if they believe they can get a higher price later. Producers also recognize the same situation, so they are encouraged to ask for higher prices now as they believe prices will be even higher later. Each of these four factors has a role in helping to encourage the price of oil to be higher. However, it is difficult to imagine they would cause the price to double in such a short time. Oil trades on the futures markets. For each forward month, traders speculate what the price of oil might be. When the price over the forward months rises in an upward sloping curve, it is known as cantango. When oil is in contango, the price for delivery at a future date is higher than the spot price (the current price). It is also higher the farther out you go. When oil traders see a contango situation that they believe will remain for some time, it pays to buy oil now and hold it, waiting for the higher price to come along. What if you had access to very low cost money and you could invest it in an asset that has the potential to rise. You would be very tempted to borrow the money if you had a place to invest it at a higher return. It turns out oil traders, who have access to low cost money, are borrowing all they can get, while buying oil for delivery sometime in the future. The current prime rate is set at 3.25%. Traders who bought oil at the $40.81 a barrel on Dec. 5 could have sold futures contracts for delivery next December at $54.65, a 34 percent gain. After taking into account storage and financing costs, investors would earn about 11 percent, according to Andy Lipow, president of Houston consultant Lipow Oil Associates LLC. Borrow at 3-4 % and get n 11% return. Pretty good deal, if you can get. The spot price of oil closed at $69.55. Contango means the price in future months is higher. According to Ship Charting approximately six crude oil tankers, 20 oil product tankers and four liquefied natural gas (LNG) tankers are floating off Malta, the highest density of anchored tankers outside ports in the world, according to AISLive ship tracking data on Reuters. That means at least 20 million barrels of oil, or about a quarter of the world's daily demand, are on the seas around Malta, while the data showed few in May.” Malta's total daily oil use is about 19,000 barrels a day. According to Reuters, the volume of refined fuel stored on ships floating at sea has jumped nearly 71 percent since early April. U.S. investment bank JPMorgan Chase & Co has hired a crude supertanker to store gas oil off Malta's coast. Chase is one of the large banks that received TARP money and they had access to the Feceral Reserve’s lending facility to help the economy avoid a depression. I am not saying that Chase is borrowing money from the Fed at extremely low rates and then buying oil to make a profit, as I do not know this is taking place. According to Mike Wittner, head of oil market research at Societe Generale SA in London, contango can definitely pay for storage and the cost of capital and leave plenty left over. Royal Dutch Shell Plc sees so much potential in the strategy that it anchored a supertanker holding as much as $80 million of oil off the U.K. to take advantage of higher prices for future delivery. The ship is one of as many as 16 booked for potential storage instead of transporting crude, said Johnny Plumbe chief executive officer of London shipbroker ACM Shipping Group Plc. How long can this investment continue? It depends on contango and the slope of the oil futures. Should the curve flatten or even go down (called backwardation) the traders will be selling the oil as fast as they can, as they do not want to sell their oil at lower prices. This will force prices down. I suspect several traders have lock in their profits already, capturing part of their gains, and hedging the rest. It is likely a number of traders and firms are still long oil. Should these traders see the curve flatten, they will be desperate to sell their oil. Should this occur, we could see a steep drop on the spot price. John Kemp of Reuters has a nice blog entry titles “Doing the Contango” If you wish to learn more, I suggest reading it. As investors who do not have access to a bank with a pipeline to the Federal Reserve, we are faced with a more difficult situation. Eventually the rising curve known as contango will reverse. When it does, it will push down the prices of the energy sector stocks and ETFs. This event will create an opportunity to buy into quality stocks, the sector and the commodities. When all this oil comes into the market, it will be relatively short lived. Producers worldwide have cut back on investments in marginal projects due to the steep decline in oil prices. Many non-OPEC countries are already seeing a decline in the production capacity. This lack of investment will accelerate this problem. Even OPEC nations have curtailed some of their investment, which will hinder ramping up production when demand returns. When demand returns in emerging countries as well as Europe and the U.S., we should expect prices to rise, possibly to new all time highs, priced in U.S. dollars. With supply more constrained and demand returning to prior levels, it is only reasonable to expect the price to climb. OPEC’s ability to act as a buffer will be limited. Investors should expect higher highs and higher lows. The next drop in the price of oil should create an opportunity for stock, ETF and commodity investors, once an interim low is reached. We need to monitor the price of oil and whether it stays in contango over the next several months to get a better idea of what we should do next. Our Premium Members receive suggestions on when to use roll call options to reduce the down side risk of various portfolio positions. If you are interested in learning how to use call options, you should give our four-week free trial to the Premium Membership a try. There is no risk, nor any obligation. If you have any questions regarding membership, please send an email to service@tradingonlinemarkets.com and we will get right back to you. Your complete satisfaction is of utmost importance to us.